Kuwait Towers is a group of three slender towers that symbolizes modern Kuwait and also World cultural as well as touristic landmark. The design was done by Swedish architects Malene Björn and Sune Lindström of Vatten-Byggnadsbyzan (VBB). Kuwait towers were built in March 1979 with two major towers and a minor tower. The height of main tower is 187 meters (614 ft) and consists of the Ground Floor, Main Sphere and the Viewing Sphere. The main tower is also home to Kuwait Towers’ signature restaurants, cafés and reception halls; the lower sphere holds in its upper half a restaurant for 90 persons and in its bottom half a water tank of 4,500 cubic meters. 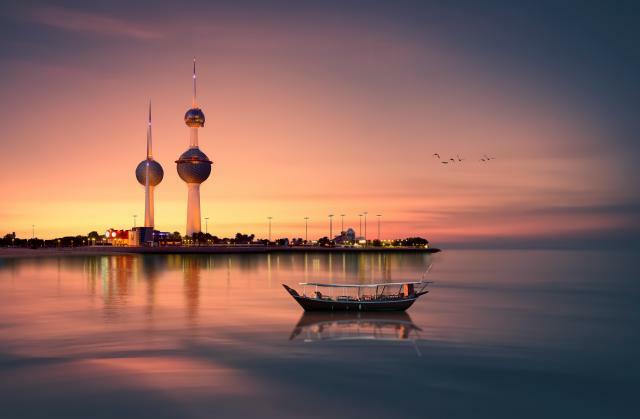 Rising to 123 meters above the sea level, the viewing sphere completes a 360° turn every 30 minutes so that visitors can experience a panoramic view of Kuwait City. The second tower serves as a water reservoir and is 147 meters high. The third tower houses equipment to illuminate the two larger towers and supply electricity for some areas in Kuwait City. Phoenicians were the experts in irrigation by using artificial canals, feeder channels, weirs and dykes to channel water from the rivers and streams that crisscrossed the coastal plains.